It's called Karavai, and it is a part of celebrations, or whatever, and sometimes given to special guests, as it was to me. I'm special. On Tuesday night I hopped a train after work to Mikolayev Oblast. 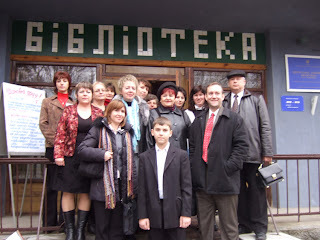 I had three tasks the next day; represent the embassy at the opening of a USG-funded internet center at a small, regional library in Voznesensk (2 hours north of Mikolayev city), a press conference to discuss consular issues with local press, and an event at an 'Window on America' center at the Mikolayev library to discuss student exchange programs. What is likely a 6 hour drive is an 11 hour train ride. Local train, makes all the stops. On the way there, I sat in my compartment (2nd class sleeper, the so-called koo-pay, well known to my friends from my semester in St. Pete so long ago; 4 beds, but the embassy buys out the compartment so I don't have to travel with the hoi polloi) and went over what I was going to say at the Vosnesensk event, the only one I would do in Russian. The starts and stops and announcements at each podunk station conspired to give me about 3 hours of fitful sleep. Bleary-eyed, I stepped off the train at 6:00 am and was met by a driver, who whisked me away. His stream of dialogue as he drove through the still-dark streets was entertaining, if unwelcome at that hour. I don't know if he was especially proud of everything about the city, or if there just wasn't that much to brag about. 'On the right is our huge market. And they're building a new one because the huge one isn't big enough anymore.' At that he exhibited a wry grin and shook his head, as if overcome by the town's embarrasment of riches. Oh, really, I say, that's interesting. How many shipworks are still operating? 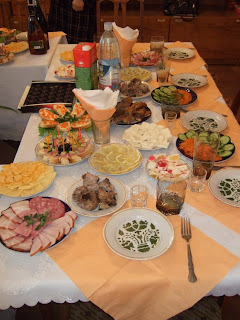 So we went to Voznesenk, two hours to the North. The opening, wherein I receive the aforementioned Karavai, and delivered the best damn 5 minute remarks ever given in Russian...by me. 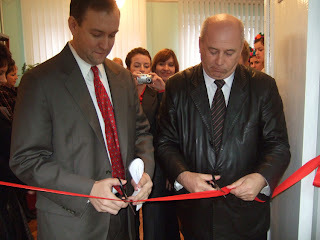 I even got to cut the ribbon with the leather-clad Mayor of Voznesenk. A lovely guy named Yuriy. After numerous speeches by various local officials (and me, of course), we toasted the opening (at 10:15 am) with champagne. The crew, heading out after the festivities. The mayor and library director insisted that before I leave their beautiful city of 40,000, I visit the local museum and the local high school. So we went. 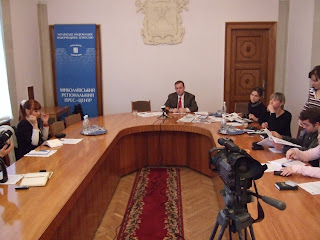 Back in Mikolayev later, I held a press conference with local press to talk about various consular issues, mostly related to fraud prevention and student exchange programs. About 12 print reporters and 3 camera crews showed up. Who knew that Mikolayev, population 700,000, had so much press. On the way to catch my 7:20 pm train, the driver paused in his running commentary about his town and rummaged through a few cassettes. He came up with one, gave me a satisfied look, and put the tape in. He looked back to me and smiled as a pan flute and synthesizer rendition of Yesterday, by the Beatles, started up on the stereo. It's unclear what type of vibe I was giving off to make him think that this was the music needed at the moment, but I actually think it fit quite well. Told ya the traffic was bad.